Transport yourself to another world, to the plains of Africa. Fight for survival and become top of the food chain. Transport yourself to another world, to the plains of Africa. Fight for survival and become top of the food chain. Pit yourself against one another; Rangers, Poachers and Animals. Herd, Plunder or Remain Free. Become the Pride of your pack. 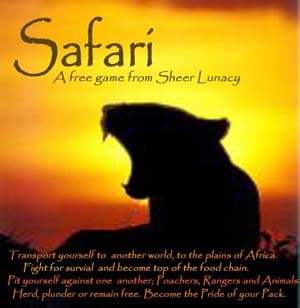 Safari is a game of three teams with each having their own specific aims and rules to follow; however each player works as an individual. The teams are as follows; Animals, Rangers and Poachers. When play begins the Animals are let loose. Their ultimate aim is to remain free. The Rangers are the next group to be released into the game. Their aim is to herd the Animals. They do this through chasing and catching an Animal. Once caught an Animal can be branded with the Rangers own specific mark. There is however another role the Rangers must fulfill. This is to protect the animals from the Poachers. The Poachers are only out for money. They will chase and catch Animals, seizing valuable body parts such as Hide, Bone and Tooth. It is the Rangers duty to ward off the Poachers and confiscate any of their bounty if they catch them. Animals may fight back. If they can get into large groups they can stampede, scattering Poachers and Rangers alike. Animals can also replenish their stocks of Hide, Bone and Tooth by scavenging them from various corpses placed within the playing area. The Animal that remains the freest, the Ranger that herds the most Animals and the Poacher that has the most plunder, win the day and become top of the food chain. Sheer Lunacy are a creative collective dedicated to the installation of daydreams into the modern world; A mixture of performers, artists, designers and creators with an ongoing mission to combat perceived reality through playful acts of chaos, mania and pleasure.